Organic. Free from detergents, SLS alcohol, parabens, sorbates, silicones, sulphates and preservatives. Not tested on animals. 100% suitable for both vegans and vegetarians. 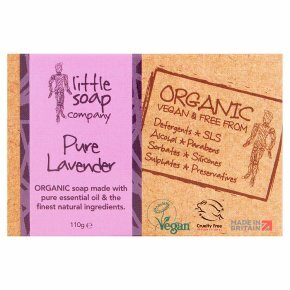 Organic soap made with pure essential oil & the finest natural ingredients. Lavender is the new black. It's versatile, calming & relaxing. Pure & simple, just as Mother Nature intended. The perfect bar for the basin, bath or shower.